The Bichpoo is a cross breed obtained through the mix of the miniature or toy Poodle and the Bichon Frise. These dogs are a small sized breed, reaching up to 35 centimeters tall and up to 10 kilos weight, but have an overall sturdy build. The coats of Bichpoos are most often white, but they can also be apricot, black or blue sometimes. The length of the coat is medium to long and because it presents curls, it requires frequent brushing in order to prevent occurrence of tangles and mats. Bichpoos are intelligent dogs, but they also manifest a lot of affection and are loyal to their people. Despite their size, they are pretty good watchdogs, promptly alerting their masters when they sense approach of intruders or anything that stands out of the ordinary. They have a tendency to bark a lot, but this can be covered by appropriate training during their early ages. Because of their intelligence, they are can be trained easily and they have a natural ability of learning new tricks and obedience training. They love to play, but are not excessively active, therefore they will only need a medium level of physical exercises. The Bichpoos are good family dogs and can adapt easily to any type of living environment. Gentle in nature, they get along quite well with children, although they do have a preference for older children who are more aware of how is best to handle a dog. They can do well with other pets, as well. 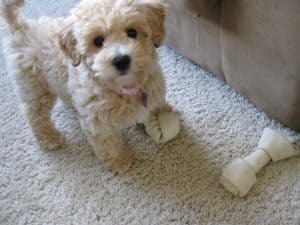 The average life expectancy of this breed is up to sixteen years.The traits of both parents are relevant for the development of the temperament of the Bichpoo puppy. The Bichon Frise dogs are well known as being very playful, lively and sweet. Even from the start, these dogs have been used as companion dogs, due to their gentle natures, but also for the fact that they get along very well with children and other pets. They are very good choice for people suffering of allergies. The daily exercises are only required in moderate amounts for these dogs, which are known to have spontaneous bursts of energy, starting running very quickly for no particular reasons. Fortunately for the owners, these bursts come in brief episodes, sometimes taking less than a minute and finishing just as quickly as they began in the first place. This is regarded as an amusing characteristic and is perceived by people as being entertaining, rather than a problem. There are other dog breeds which are known to manifest in the same way. The Bichon Frise dogs are highly trainable and obtain the best results when the training process starts when they are very young. It is a trait of smaller sized dogs that they can be a bit of a challenge to housetrain, but with the proper consistency this can be resolved. Because they are very affectionate towards people and are sociable dogs, they are good companions, also because they love to be in the presence of people. The life expectancy can be up to thirteen years. 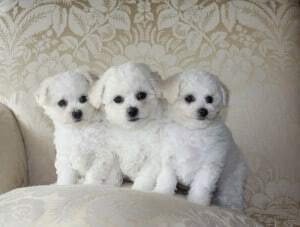 The Poodles come in three different configurations: the toy is the smallest, with a maximum height of 25 centimeters and a weight of no more than 5 kilos, the miniature is second with a maximum height of 40 centimeters and no more than 8 kilos weight and the standard Poodles are the biggest, with over 40 centimeters height and weighing up to 30 kilos. Maybe not all people know, but the Poodles are considered to be the second most intelligent dog breed, because the optimal mix between their intelligence and desire to please people, which allow them to be excellent during obedience training.It easy quite easy to housebreak Poodles, who have very loving natures and love to be in the center of attention. Sociable dogs, they are also very devoted to their masters and make good companions for them. Poodles are calm and have a well balanced temperament, which is an advantage in bonding with their human family. They are getting along very well with children, especially the standard Poodles, while the other two, the toy and the miniature, prefer older children who are more aware of how to best handle dogs. They hate being left alone and react badly to this, so it is highly recommended to leave them isolated for long periods of time. Poodles require a rather low level of grooming, mainly because they are very low shedders. Brushing is only required every five to eight weeks, in order to prevent tangles and mats from forming in their dense, curly coats. Poodles are among the most suitable dogs for people with allergies, thus gaining their title as hypoallergenic dogs.Active and playful dogs, Poodles will enjoy a lot daily sessions of walking, running and playing.